It’s Here: Amish Bakery Challenge is Out! 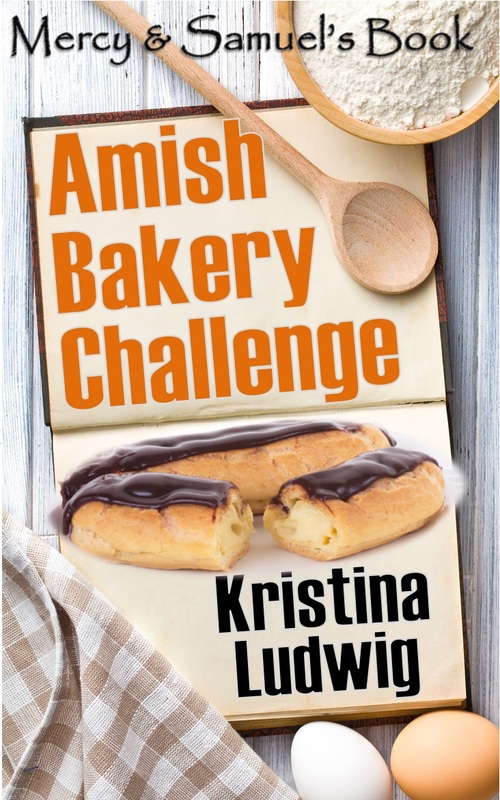 Cover Reveal: Here’s the new cover of Amish Bakery Challenge, designed by Antonio! What do you think? Amish Bakery Challenge was one of my favorite Amish novellas to write, not only because I adore Mercy and Samuel, but because there’s so much at stake for the young couple. They’ve worked hard to build the general store and bakery of their dreams, but Mercy’s old boss, Mrs. Stoltzfus of Stoltzfus Bakery, accuses Mercy of stealing her recipes and her business. Soon, Mercy must deal with a boycott of her beloved bakery, and Samuel, ever the problem-solver, must devise an innovative way to appease Mrs. Stoltzfus while still keeping the business intact. The book is full of high drama, and even a shunning. It’s also my longest Amish novella ever, so I hope you enjoy it! Here’s an excerpt from the book. Chapter One is found at the end of Amish Baby: Hannah and Jakob’s Book (Book 1 of the Amish Couples series), and Chapter Two is found in this recent blog post. Happy reading! I flounce upstairs, and Samuel trails wordlessly after me. I can’t believe that he’s even considering studying on a Saturday night, when we’ve both worked so hard all week. And I can’t believe that he’d want to “stay in” this noisy house. I know I’ve only been home for a little over an hour, but I already feel the need to get out. It’s as though the walls are closing in on me. I fling open the door of our bedroom, which I used to share with my twin sister, Rebekah. One small bed sits in each corner of the room; Samuel and I can’t even sleep together—not that we haven’t tried. Once, we pushed the beds together, which ended horribly. They’re not exactly the same height, and I rolled into the crack between them in my sleep, and woke up the next morning with my hand numb from being wedged in there for hours. We also tried cramming ourselves into one tiny bed, which seemed like a fine option until Samuel rolled off one night and crashed onto the floor. Then, of course, my entire family came barging into the room, demanding to know if everything was okay. There’s no privacy here, and even the beds are conspiring to ruin our love life. Hannah always tells me how beautiful it is to fall asleep in her mann Jakob’s arms; I can’t even imagine feeling that romantic about bland, serious Jakob, so I’ll have to take her word for it. However, I’m sure that sleeping in Samuel’s arms would be amazing—if I ever had the chance to do it. I study my mann’s tight, drawn face, and wonder what to say. I know that he has a demanding school schedule, and balancing that with chores, farming, and working in the general store is nearly impossible. But I also know that I need time with him. Between work and my noisy, nosy family, I feel as though I never see my mann alone. I don’t want to fight with him, but I do want to get my way. So, I purse my lips into what I hope is a luscious pout. “Okay, then, I’m going to sleep. There’s no need to stay awake if my mann doesn’t even want to take a short ride with me.” I collapse backwards on the bed, closing my eyes, but a moment later I open one eye ever-so-slightly to gauge Samuel’s reaction. “Mercy,” Samuel says in a warning tone. I simply lie there, squeezing my eyes shut. “Come on, stop it,” Samuel says, his voice heavy with irritation. My eyes pop open, and I can see that his face has turned the same deep red as the beets that I canned for the general store last fall. What? Suddenly, I can almost feel my blood bubbling through my veins, hot with fury. I squint at my mann and hop off the bed, slipping on my shoes and fastening my bonnet on top of my head. I stare at Samuel with narrowed eyes. The truth is, I hadn’t really thought much about where I’d go to leave him alone. I wouldn’t mind a change of scene, but I know I couldn’t possibly go to the city. When I snuck off to visit Rebekah, I’d been single and on Rumspringa. Now, I’m baptized and married, and would be shunned for leaving the community without the approval of my mann and the elders.